Our Colorado’s Reel History blog series showcases some of the many newspapers in our collection. This month we feature The Chronicle-News, the Trinidad newspaper that once employed Ina Eloise Young, the first American woman sports editor. 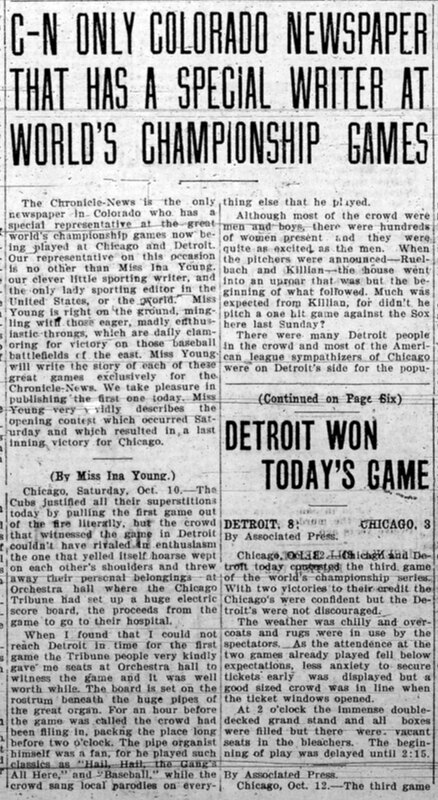 Check out some of The Chronicle-News’ headlines in the slideshow below, including sports features written by Young, then read on for more information about the history of this paper. Located in southern Colorado, Trinidad was settled as early as 1859. Felipe Baca and a dozen families from New Mexico moved to Trinidad as an area favorable to agriculture and ranching. Baca built a lumber mill, donated the land for a townsite, and helped organize the Trinidad Town Company. The town of Trinidad was officially incorporated in 1876 and two years later the Santa Fe railroad reached town. While farming and stock raising were profitable, coal mining replaced them as the main industry. In 1898, The Chronicle-News was created from the merging of the Trinidad Chronicle [LCCN: sn90051522] and the Trinidad Weekly News [LCCN: sn85067330] under the leadership of Daniel W. Stone. The inaugural issue of The Chronicle-News appealed to the people of Trinidad and Las Animas County to look upon the new paper as “one of its public organs and at all times feel a perfect freedom and liberty in suggesting . . . anything that is for the public welfare of the community.” The Republican leanings of the paper were aligned with that of Stone, who was active in Republican politics at the county and state level. He was also the clerk of the Las Animas County district court and postmaster in 1901 and 1906. In 1911 Stone sold The Chronicle-News to Judge Jesse G. Northcutt, who was publisher of the paper until 1927. A. R. Brown served as the first editor under Northcutt until 1913, followed by Fred Windsor, who was editor from 1913 to 1937 (and again from 1938 to 1957). Under Northcutt and Windsor, The Chronicle-News notably reported on the lead-up to and the culmination of the Colorado Coal Wars, which lasted from September 1913 to December 1914. During this period tensions between coal miners, striking for better work conditions and pay, and mining companies—Colorado Fuel & Iron (CF&I), Rocky Mountain Fuel Company, and Victor-American Fuel Company—erupted in the Ludlow Massacre. On April 20, 1914, the Colorado National Guard and CF&I guards attacked Ludlow, a tent colony of 1,200 striking miners and their families, fired machine guns into the camp, set fire to the tents, and killed approximately 21 people, including miners’ wives and children. Acting as the assistant special prosecutor during the strike, Northcutt was involved in the events of the Colorado Coal War. His paper laid the blame of the massacre “at the door of a lying union press . . . [that] railed at law and order, mercilessly assailed the civil and military authorities and openly lauded deeds of violence.” The paper carried eyewitness reports of the “Ludlow Battle” by its own reporters. In retaliation for the attack on Ludlow colony, the striking miners attacked anti-union establishments and skirmished with the Colorado National Guard. During the so-called “Ten Day War” dozens more were killed. The Chronicle-News characterized the striking miners as a “band of outlaws that are terrorizing the district and shedding blood with reckless abandon.” President Woodrow Wilson sent in federal troops, who disarmed both sides and brought the fighting to an end. The strike was called off on December 10, 1914, with the companies failing to meet the demands of the striking miners. In 1927 Rupert Ewing McClung purchased the paper and along with his wife, Lillian, served as publisher until his death in 1934, at which point Lillian took over The Chronicle-News. Her sons, Robert and Rupert, managed the papers between 1927–1934 and 1934–1937, respectively. The paper had a number of publishers after the McClungs sold the paper in 1937 until 1969, when it was incorporated into Lake Charles American Press, Inc. The McClungs’ granddaughter, Cosette Henritze, became editor of The Chronicle-News in 1989. The Chronicle-News continues to publish today under local ownership. These newspapers have been digitized thanks to an NEH National Digital Newspaper Program grant. You can also read issues of the newspaper online at Library of Congress’ Chronicling America and the Colorado Historic Newspapers Collection. Want to learn more about Trinidad? Visit our Trinidad History Museum!